In my college days living in the Collins Hall dorm, my roommates and I spent our Thursday nights watching Grey’s Anatomy, refresh our Facebook feeds during the commercials, all while gathered around a bowl of puppy chow. There is something about the combination of melted chocolate and peanut butter with a bag of powdered sugar on top that just brings people together. 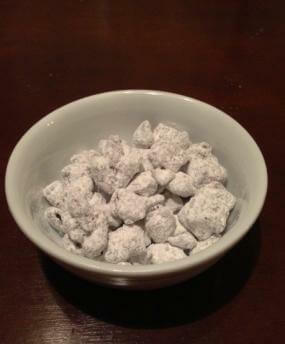 This Saturday night, when Trey and I started craving something sweet my mind immediately took me back to my Collins kitchen days and 30 minutes later, we too had a bowl of puppy chow. It may not have been a Thursday night and a Joseph Gordon-Levitt movie was playing instead of McDreamy, but no matter who you are gathered with, puppy chow is still as sweet. 1. Melt chocolate in a double broiler, by placing a small amount of water in the bottom pan, the water should not touch the top pot. Place the chocolate in the top pot and start heating. Stir frequently until chocolate is just melted. Mix in rice cereal and dried berries. 2. In a microwave-safe bowl, melt peanut butter in microwave, starting at one minute until smooth. Stir in with chocolate, rice cereal and dried berries. Add vanilla extract to mixture. 3. Pour mixture into gallon-sized plastic bag with powdered sugar. Shake the bag until all of the mixture is coated with powdered sugar.